You will visit two of the most impressive attractions and UNESCO sites of the world in this Agra half-day tour. Both Taj Mahal and Agra Fort are in UNESCO heritage sites and show a perfect level of craftsmanship of Mughal architecture. This half-day Agra tour will surely take your breath away with lots of memories and experience. 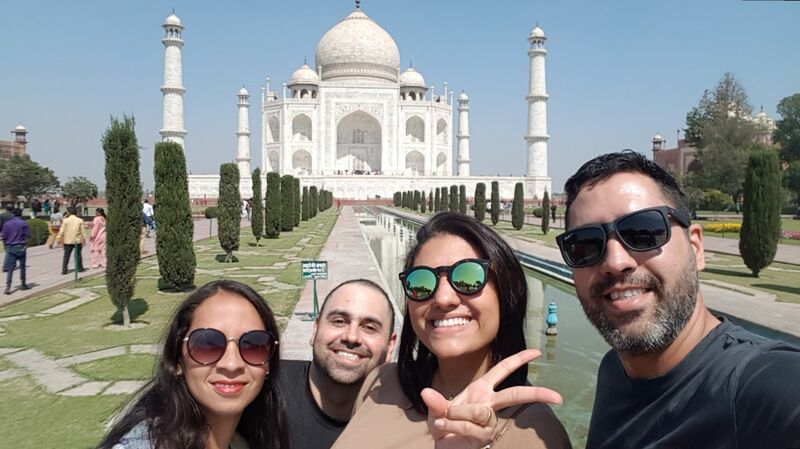 The Agra Half-day tour starts with the Taj Mahal. The building is the ultimate symbol of love of Mughal Emperor Shah Jahan for his beloved wife Mumtaz Mahal. The majestic structure is made entirely of white marble and its walls show the wonderful work of Pietra Dura (stone inlay). The stones used in the Taj Mahal are rare and precious which display the magnificent interiors. The Taj Mahal is on the banks of Yamuna River and around the Charbagh or 'four gardens' plan. After the Taj Mahal, visit Agra Fort, a building built entirely of red sandstone. It was the seat and stronghold of the Mughal Empire during Akbar's reign. The building consists of various palaces, pavilions and mosques inside its premises. The gates, walls and first buildings were erected by the Akbar on the banks of Yamuna River. Shah Jahan and Aurangzeb added the quarters and outer ramparts respectively. Explore the Diwan-e-Aam or the Hall of Public Audience and Royal Pavilions. Also, enjoy the stunning views over the river and the Taj Mahal from Musamman Burj. $60 ( For One Person).